It was a rousing scene that’s forever etched in the minds of thousands of D-backs fans. 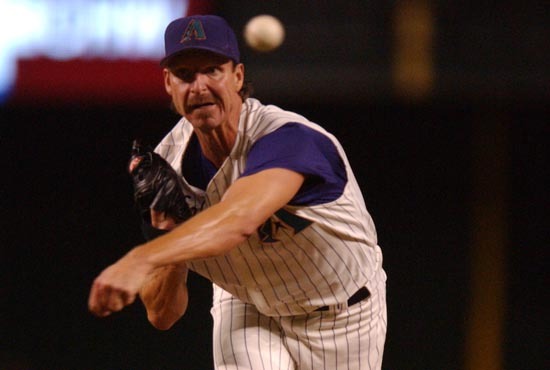 The left field bullpen gate swung open and out walked Randy Johnson. The Big Unit began a slow trot to the mound in the seventh game of the 2001 World Series, just one day after pitching his team to a 15-2 win in Game Six. The left-hander came on in relief during Game Seven of the 2011 World Series against the Yankees. Johnson was the winning pitcher not only in that decisive seventh game, but went 3-0 in the Fall Classic in two starts and the lone relief appearance. In that stretch, he notched a 1.04 ERA with 19 strikeouts. In his first start in Game Two, he unleashed a three-hit shutout against the Yankees. When the series returned to Phoenix for Game Six, it was Johnson who kept the D-backs’ season alive. The dominant left-hander allowed just two runs while scattering six hits and striking out seven in seven innings of work. It turned out that he could in fact pitch one night later when his team needed him. Johnson was his usual self as he retired all four of the Yankee batters he faced. Ten years after that World Series, the Big Unit returned to Chase Field on Saturday to take part in the D-backs’ World Championship Reunion Weekend. Johnson, along with fellow World Series Co-MVP Curt Schilling and D-backs founder Jerry Colangelo, threw out the ceremonial first pitch. For Johnson, it’s hard to believe that 2001 was 10 years ago. The reunion featured many members of the team, as well as 2001 manager Bob Brenly, former General Manager Joe Gargiola Jr., former president Rich Dozer, and Colangelo. The event allowed Johnson to reconnect with teammates that he hasn’t seen in years. The 2001 season was a special one for the D-backs and the state of Arizona. The team featured a plethora of veterans who all shared the common goal of winning a world championship. Johnson and the D-backs find themselves celebrating the only major championship in Arizona history at a time when the 2011 D-backs are 8.5 games ahead of the Giants for first place in the NL West. Much like 2001, this year’s squad has enjoyed no shortage of success on the baseball diamond. Also similar to 2001, this year’s pitching staff has been anchored by not one, but two stellar starters. Johnson and Schilling pitched the D-backs to success 10 seasons ago, and this year it’s Ian Kennedy and Daniel Hudson doing the same. Although it seems like just yesterday, the 2001 World Championship came 10 years ago. Yet it’s something that Johnson will not soon forget. Yes Randy, 2001 was a VERY GOOD year!!!! Thanks to the whole TEAM!!!!! This, of course, will always be one of the favorite Memories for all Arizona Sports Fans. It was the ipitamy of “TEAM”, as virtually everyone contributed toward “Winning It All”……………..
Not unlike the 2011 Diamondbacks. The Diamondbacks have always been a “Source of Pride” for all of us, here in Arizona. I for one, would like to personally Thank Jerry Colangelo, for his efforts in getting the Team here. They are a Class Organization, and for the most part, every Player who has ever worn a Diamondbacks Jersey, is most-assuredly, a “Role Model” for both children and adults alike.